It is winter now, and orb weavers (family Araneidae) are mostly spiderlings snuggled inside cozy silken egg sacs created by their mother. They will emerge when day-length is suitably long enough, and warmer weather more consistent, for prey animals to be more common. 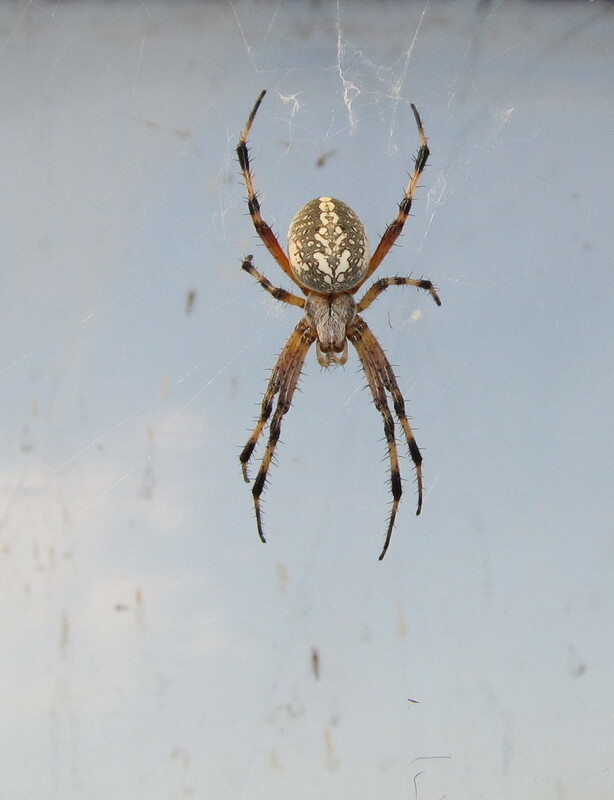 By late June, and into October, adult Arizona specimens of the Western Spotted Orbweaver, Neoscona oaxacensis, will be abundant, especially around wetlands and fields close to water. This is by far the most common orb weaver I encountered while I lived in Tucson, and the Sweetwater Wetlands was a great spot to find them. The species occurs from Texas to Kansas, Illinois, and Indiana, and west to Colorado, Utah, Nevada, California, and eastern Washington state. It also ranges through Mexico and Central America to Peru. They are fairly large as adults, females 11-17 millimeters in body length, males 5-12 millimeters. No two specimens are alike, though, at least in color and pattern. 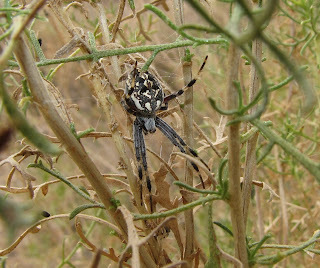 Much like each zebra has its own unique pattern of stripes, so, too, do individual N. oaxacensis spiders have their own individual pattern of spots, if it has spots at all. Note among the images shown here how variable the dorsal pattern on the abdomen can be. 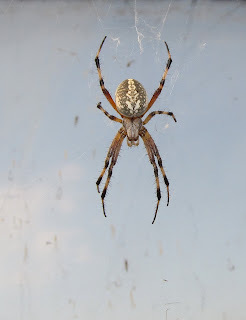 Interestingly, the ventral pattern (image below) is much more consistent and can help place the spiders to genus in places where there are other similar orb weavers. 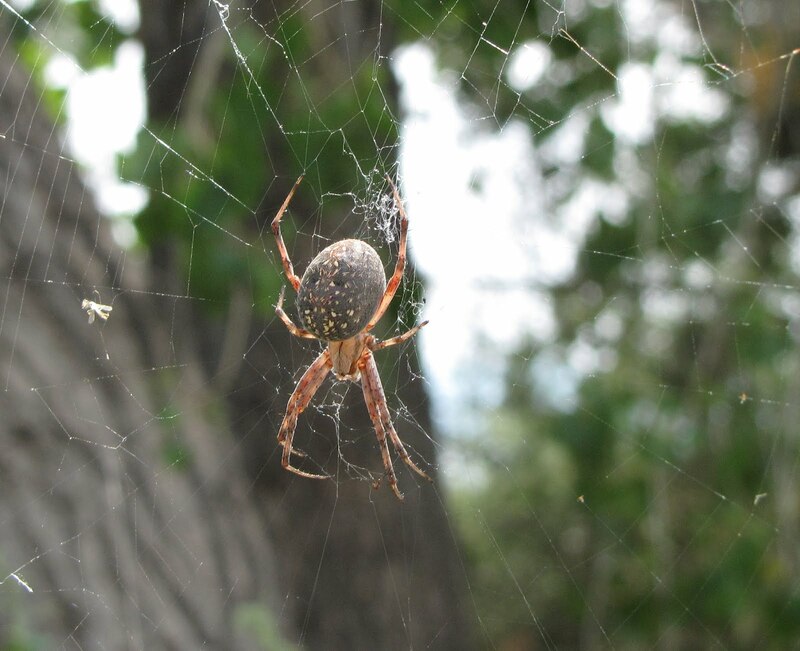 One study in avocado orchards in San Diego County, California revealed that spiderlings begin emerging in the first week of March, with more emergences through April. 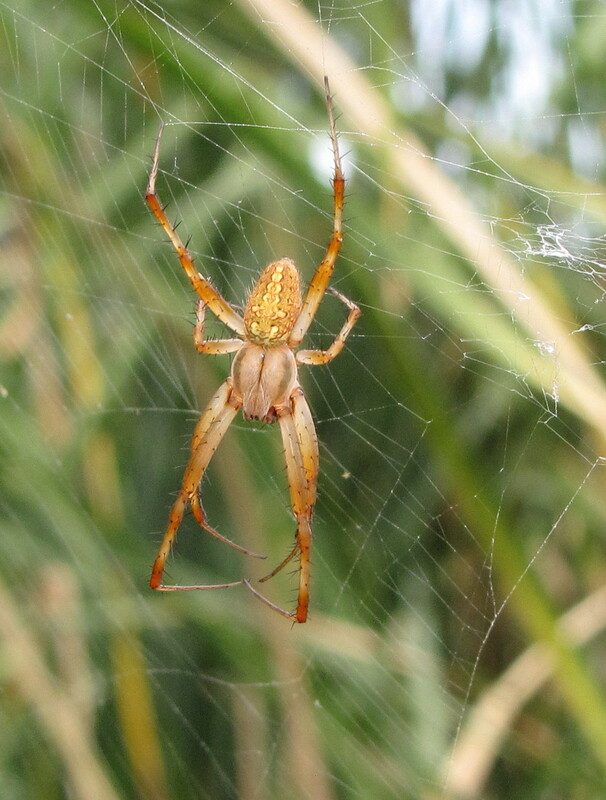 The spiders then began decreasing in number from May until late October when few adults could be found. The adult spiders do not overwinter (Pascoe, 1980). Repairing the web, feeding, and mating, are mostly early morning or nocturnal activities, though the spiders often occupy the hub (center) of their webs during the day, too. Sometimes a spider may retire to the periphery of its web, in some kind of retreat such as a curled leaf. This can be a common behavior in regions with intense midday heat and a lack of overhead shade from a tree canopy. The spider needs to avoid overheating and dehydration from the blazing sun. The retreat may be connected to the hub by a bundle of “signal threads,” but again this is uncommon for Neoscona. 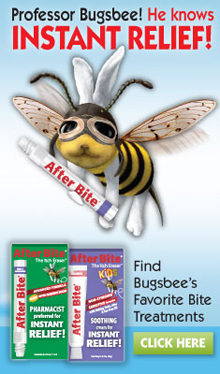 Prey consists of flying insects, especially barklice, beetles, and moths. Webs usually stretch between vegetation at a height of 1.3-1.7 meters (4-5 feet) off the ground, though I have found them at lower levels. The prey-catching portion of the webs may span from 9 centimeters to over 39 centimeters ( 3.5-15 inches), varying according to the size of the spider. Younger spiders obviously spin smaller webs. The Western Spotted Orbweaver can occasionally exhibit large, localized populations whereby the spiders can be exceedingly abundant in a small area (Allred, 1973). Do keep your eyes open for these wonderful arachnids. There are other common members of the genus Neoscona that can be found in eastern North America, too. More on those in later posts. Sources: Allred, Dorald M. 1973. “An unusual population of spiders in Utah,” Great Basin Naturalist 33(1): 51-52. Jackman, John A. 1997. A Field Guide to Spiders & Scorpions of Texas. Houston: Gulf Publishing Company. 201 pp. Pascoe, Frank Henry. 1980. “A study of Neoscona oaxacensis (Araneae: Araneidae) in commercial avocado orchards in San Diego County, California,” Avocado Society Yearbook 1980 64: 153-186. This year I saw the last ones (adult female) in January along the Santa Cruz River / Ina Rd. A very strange winter. Wow! We haven't had much of a winter here, either, though it did get very cold a couple days ago. Thanks for the info. I have 1 large spider and 3 baby spider with webs in one area of my yard. The large spider is huge .. I like spiders in my garden - just didn't know kind they are. Thanks. We've had six of these in the last week! I live in northern Virginia and each spider has looked very similar to the third and sixth pictures you have posted. I think I may have brought them back on my car from two weeks spent in the woods. They've built very large webs between my house and the house next door and are certainly the biggest spiders we've seen in our little corner of suburbia. Kori: You have other, similar species out there, notably Neoscona crucifera. This is the time of year they are the most conspicuous. i have #3 from the top in my garden with its web spread between my pine and a lime. he is quite handsome with 4 yellow spots on his lower abdomen. im so happy hes here. we live in sunlakes arizona. 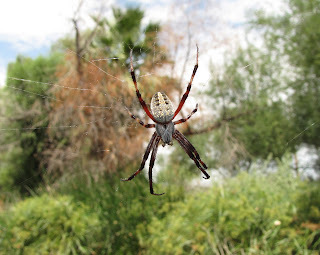 I live in Southern Sonora, where I've spotted several of these spiders in my garden. They look much like the ones you describe but their legspan is quite larger than the one you describe, about 2 in. I could end you a pic of its belly, if you would like. I have one of these guys living in front of my home. In fact, it is almost identical in appearance to the very first picture you have posted. I live in the Sonora Desert region of Southern Arizona in the city of Tucson. I believe that these must be very common here as another poster mentioned Ina road which is exactly the area that I reside. Nearly all of the images in this post were taken in Tucson, especially Sweetwater Wetlands. They are indeed an abundant species there. "Poisonous" means that something is harmful if ingested (swallowed). You mean to ask "is it venomous." Nearly all spiders are venomous (produce a toxin they deliver by biting or stinging), as that is how they kill their prey. Very few spiders are dangerously venomous to the average healthy human, and orb weavers are *not* among those potentially dangerous species. I have you all beat. My pet Orb Spider weaves it's web 3 feet from my front dood. One has been there every year for several years in a row. They are non aggressive and do not occupy the inside of my house. They are there for a short period of time so I don't bother them and they don't bother me. I moved one of the spiders one year to a different location in the yard. The next night it was right back by the front door. They are 6 feet off of the ground and 5 feet from the porch light. Or for the spider it's the Dinner Light! Hi. Your image is probably of Hentz's Orbweaver. Here's my blog post about *that* species: http://bugeric.blogspot.com/2012/11/spider-sunday-hentzs-orbweaver.html. It has also been called the "Arboreal Orbweaver," and "Barn Spider" (though the latter name is shared with a completely unrelated species. That would be unusual. These are almost exclusively *outdoor* spiders. 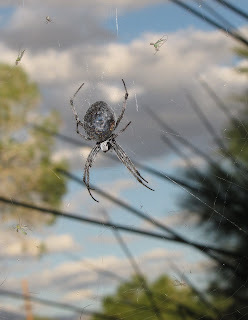 I live in Oro Valley Arizona and and have 2 of these spiders in my back yard.. I also have a small puppy. Is there any concern of the spiders stinging the puppy and if so is it toxic? 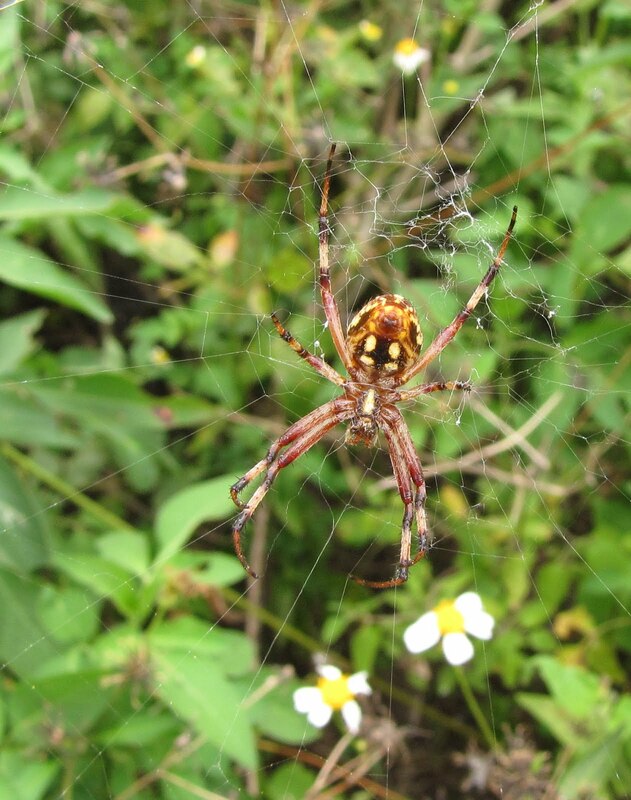 No species of orbweaver is considered by scientists to be dangerously venomous to healthy people or pets. Plus, the risk of being bitten by one is so remote as to be useless to worry about in the first place. Relax.